Union Bridge resident, “Home Run Charity” is planning to give back to her community after winning a $50,000 top prize playing the Home Run Riches scratch-off. 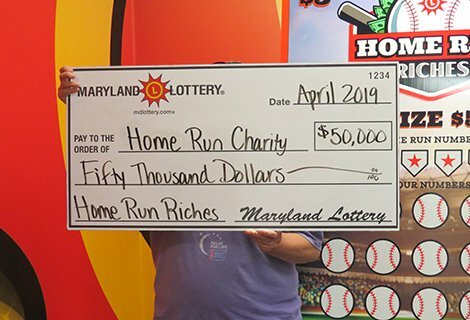 A Carroll County woman’s decision to play a few Maryland Lottery scratch-offs at the end of a trip to the grocery store last week paid off to the tune of a $50,000 top prize on the Home Run Riches game. The 57-year-old school bus driver was finished shopping at Giant #335 located at 1700 Kingfisher Drive in Frederick when she purchased four $5 games, including one Home Run Riches ticket, and played them on her way home. The lucky winner said she cried and celebrated on the side of the road before making her way home. She decided to not share the news with her husband, children and grandchildren until she receives her winnings. She did, however, tell her co-workers because they were there when she won. “I took them out to celebrate yesterday,” she said as she visited Maryland Lottery headquarters on April 12 to claim her prize.